First Concertmaster of Staatskapelle Berlin, Jiyoon Lee is rapidly building an international reputation as an emerging young artist, winning praise for her brilliant virtuosity and passionate performances. Jiyoon’s talent and endeavour in violin are decorated with numerous prizes and distinctions throughout her career. She won the David Oistrakh International Violin Competition in 2013 and was subsequently a prize winner of the Indianapolis Violin Competition in 2014, first prize winner of the Windsor Festival International String Competition in 2015 and a prizewinner at the Queen Elisabeth Competition in 2015. In April 2016, she was awarded the first prize at the Carl Nielsen Violin Competition. Jiyoon Lee is an aspiring soloist, performing with renowned orchestras ranging from the Philharmonia Orchestra, Orchestre National de Belgique, Indianapolis Symphony Orchestra, Swedish Chamber Orchestra, Odense Symphony Orchestra, Poznan Philharmonic Orchestra, Navarra Symphony Orchestra, Orquestra de Camara Galicia, ECCO Ensemble, Seoul Philharmonic Orchestra, KBS Orchestra and Korean Symphony Orchestra and collaborated with prestigious musicians including Nikolaj Znaider, Marin Alsop, Jac van Steen and Martin Fröst. Her debut recording of Nielsen & Korngold Concertos with Odense Symphoniker and Kristiina Poska is to be released in 2018. Also a devoted chamber musician, Jiyoon participates in music festivals across the world including Verbier Festival, Tanglewood Music Festival, and Kronberg Festival, and collaborates with numerous musicians. Born in 1992 in Seoul, her career as a violinist commenced at the age of four. 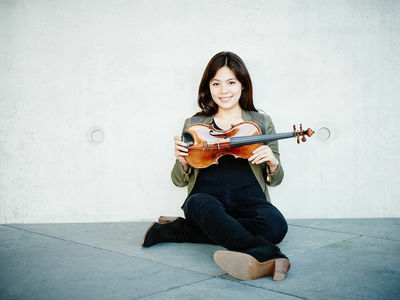 She studied at Korean National University of Arts and with violinist Kolja Blacher at Hochschule für Musik Hanns Eisler in Berlin. Jiyoon Lee plays on a beautiful C. F. Landolfi, kindly on a loan from Deutsche Stiftung Musikleben in Hamburg.